An incorrect technique is being demonstrated in Figure 2.9 because the helix is not being pulled up and back. 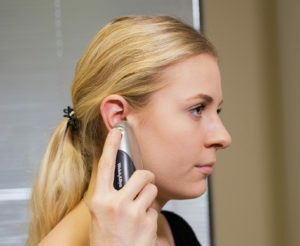 For an adult/older child, the correct technique (Figure 2.10) involves gently pulling the helix up and back so that the ear canal is visualized and the light can reflect off of the tympanic membrane. For an adult/older child, gently pull the helix up and back while stabilizing the client’s head with your hand. Finding the Error Activity: Tympanic Temperature – Feedback by Ryerson University is licensed under a Creative Commons Attribution 4.0 International License, except where otherwise noted.